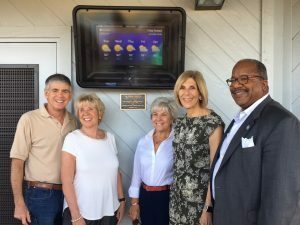 On December 13, 2016 the new Grassy Waters Weather Station was dedicated at the Nature Center. 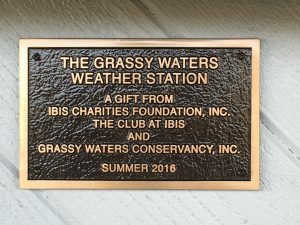 The Weather Station was funded by a grant from Ibis Charities Foundation, Inc., The Club at Ibis and the Grassy Waters Conservancy. 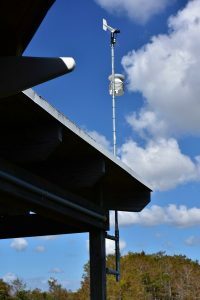 The Ibis grant and this project are of particular note…the grant was the first received by the Conservancy, and the Weather Station was the Conservancy’s first capital project. Output from the Weather Station can be seen at the Nature Center and online – click here. (Left to Right) Steven Scherer, President of GWC; Sharon Bross, President Ibis Charities; Pam Ryan, Ibis Charities; Jeri Muoio, Mayor West Palm Beach; Keith James, District 4 City Commissioner.